1. "I Wonder Which Side His Bread is Buttered On..."
The politically correct way to question someone's sexuality. See also Homosexual. 2. People Who Try to Sing Along With "The Lion King"
We all know what the opening of Circle of Life sounds like. We also know that only a psychotic baboon who talks in rhymes and creeps on animals whom nature designated as his natural predators can pull off singing it. See also African, Disney, Karaoke. The band frequently featured on Nickelodeon's cartoon "Doug". Tickets for the Killer Tofu Tour on sale now. See also 90's. The prank played by drivers and shotgun riders on the rest of the car. The secret Sudden Death Karaoke signal is when you lean over and turn up the radio and raises one eyebrow. Then, once everyone in the backseat is singing horribly offkey and attempting to drown out the too-loud song, the front seat riders (immediately and without the knowledge of the back seaters) turn off the song and revel in the embarassment of the horrible singers who know at most 3/4 of the words. See also Cars, Karaoke. The ascot's flamboyant cousin. See also Fancy. 6. Have Fun, and Don't Get into Any Mischief! Come on. What's more fun than mischief? For the commuter who loves relaxation, the earth, and awkward exposure of the area between their legs. 8. Just Don't Do Anything I Wouldn't Do! What exactly WOULD you do? Especially funny when coming from horrible role models. 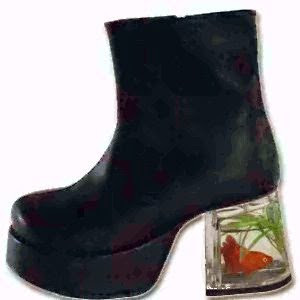 Because nothing is more groovy than dancing the night away with an aquatic animal going belly-side up in your shoe. See also Fish, Shoes. Just how do Jewish guys get them to stay on their heads? Extra points for pronouncing it "Yarr mull kay" See also Jewish.